There was a young girl who believed that every woman has a right to be educated, every girl must go to school. But the Taliban in Pakistan had a different opinion. What they do next is inexplicable, but believe it or not, in order to silence a 16 year old girl, they shot her on the left side of her forehead. But luckily she survived and continues her campaign for all girls and women in the world to be educated. Her father, Ziauddin, tells her the story of a little girl who wanted to live someday like a lion, instead of 100 years like a slave. But the name he gives to her daughter somehow transforms the endless courage and spirit of the girl from his tales into his daughter, Malala Yousafzai. 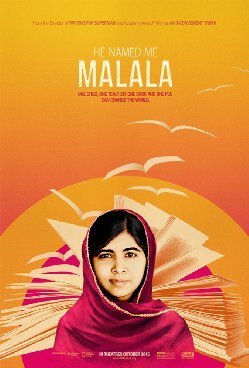 The documentary film directed by Davis Guggenheim is packed with inspiration and emotions that will make you feel proud living on the same planet with someone who did not allow the threat and dreadful murder attempt to stop her from continue fighting for what she believes in: equality, education and freedom. As the film progresses we find out about Malala more than we could have imagine; about her intelligent father, a funny young brother and how she became Malala. But more importantly, through her stories and experiences, she tries to spread the word through millions of her supporters. Malala has been my inspiration ever since I saw her on the media. She is a symbol of feminism, strength, empowerment, and freedom. It is so great seeing someone so young be so passionate about girl’s education and well-being. Definitely looking forward to seeing this documentary!